I think I'm addicted to Kale. Not angry birds addicted (although I've never played the game1) or iPhone-at-a-red-light-to-play-Words-With-Friends addicted, but certainly somewhere in between. 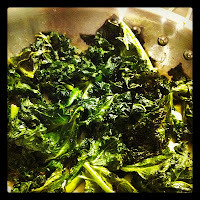 Now, I wouldn't recommend preparing your first attempt at kale to a date (it can be bitter and may require some trial and error). However, unlike something like sea bass $17.99/lb, at $1.99/lb, you can screw up a few times (on your own) without wasting too much of your alcohol money. 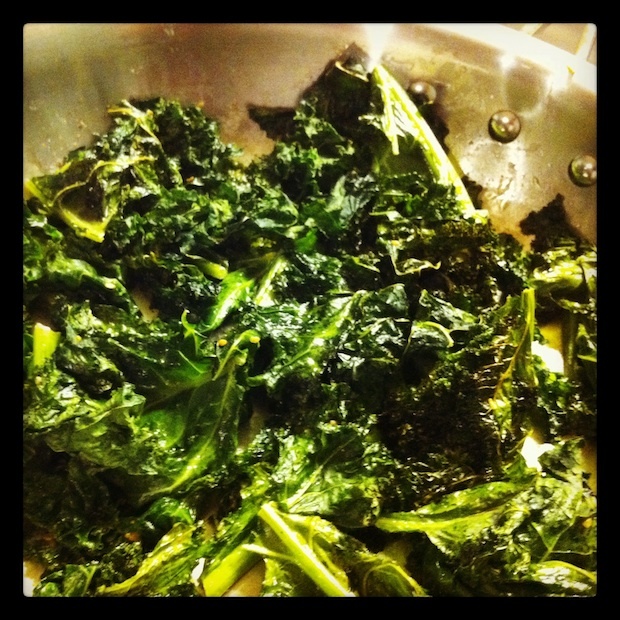 In the past (pre-addiction), I'd usually sauté kale in a skillet with olive oil and sweet onions, but now I've started to bake it. Kale is becoming a staple. On those off-nights of being a lazy, single guy who tries to hold on to the inklings of healthy eating - baking kale takes 2 minutes of prep, 35 minutes of cook time, and 15 seconds of skill (the skillet handle is hot you idiot). Oh, and its hella healthy for you. 1 One of my illogical (usually temporary) boycotts - like Wegmans (caved after 18 months) or flip flops with jeans (caved at some point) or Spotify (still holding out) or Google Reader (nope...).